Ice cream is definitely my husband's domain. You see when I meet him in New York City his roommate had just started a gelato company called Ciao Bella you may have heard of it. Well, when my husband's roommate, FW started out he catered to restaurants. A lot of Asian restaurants ordered some very unusual gelatos from him, like aduki bean and green tea. All of the gelatos FW concocted made it back to his apartment to be shared with his roommates... needless to say my husband Trip is a connoisseur of unusual ice cream. Well, Trip whipped up Dorie's recipe in a jiffy... nailing the custard. My daughter baked the Sable Breton Cookies that were recommended to have with the ice cream. I had looked very hard in the grocery store for an olive oil that said it was fruity... no luck, so we just used what we had on hand. Big mistake... much too peppery. I dressed the ice cream with strawberries, local organic honey, fleur de sel... to no avail. My husband deemed it, "disgusting," My son disliked it even more.... I think the word he used was, "vile." My daughter shrugged her shoulders and said, "Oh, well... my cookies came out good." I was the only one who ate the ice cream and was not repulsed by the taste... I'm Italian... olive oil is never going to bother me in any dish. I thought the texture was divine and dressed with the honey and salt it was interesting. But he ain't making no olive oil ice cream again! It is definitely an unusual recipe...leave it to the French to think of olive oil in ice cream... on second thought I might have expected this more from the Italians. a classic Food Failure Friday! (i think this would make a nice addition to the blog....) what's the WORST thing you ever made? Yes, "Food Failure Friday" a food linky you don't have to be proud of. Thank you for sharing your olive oil ice cream experience. I'm the person who posted the WS story on olive oil today and appreciated seeing your comment. For a very fruity oil try an Ascolano (aka Ascolana). This olive variety was originally grown in California for table olives, but is increasingly in demand for olive oil. When UC Davis and the CIA in Napa demonstrate "fruity" for olive oil seminars, Lucero Olive Oil's Ascolano is the one they use. It is a multiple gold medal and best of class or best of show olive oil (it was Best of Show in this year's California Olive Oil Council competition) and would make a fabulous dessert. One final note to all of your readers, if your fine olive oil smells like walnuts, peanuts, crayons or nail polish it has become rancid due to age or exposure to heat and/or light and should be discarded and replaced with fresh oil. If it is within the "Best if used by" date and newly opened you should return it for a refund and let the manager know that their stock should be checked. Thank you so much for your olive oil advice... I wish I had found your post before I made my dessert. This week I'm your gal. I spent three months in Cambria, California this Winter and searched out the olive farms. I finally settled on the products at http://www.oleafarm.com/ near Pasa Robles. It's owned by a young French couple, Yves and Clotilde, and Yves and I spoke French (mine is very, very fractured but he acted as if he understood me) the entire time. Two of the olive oils I purchased were Orange Blush (used in the Olive Oil Ice Cream) and I use their Lemon Blush alot. Now, you're on two different coasts and I am sure you can buy locally. There are such animals out there is what I am saying. I am going to try to re-create the Lemon Blush myself. I liked the ice cream, was surprised by that myself. Thanks so much for the source. It's too bad your family didn't enjoy this more because it looks great! You can also check out www.pasolivo.com that's where I got the Lime Olive Oil. Thanks...I really like the idea of lime olive oil for savory cooking too.. What other dishes do you use it in? 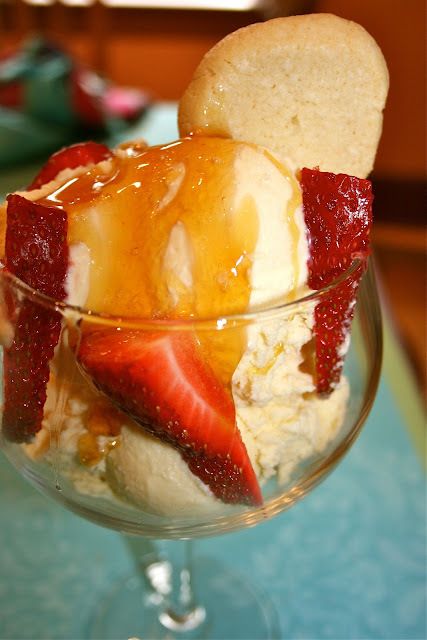 I think that the idea of adding some honey and strawberries to the olive oil ice cream sounds wonderful and the cookies that your daughter baked look so nice - too bad the rest of the family was not all that happy with the ice cream, might just be the kind of olive oil. Glad you enjoyed it though. It was definitely the olive oil but I'm afraid I've scared them away from ever trying this again which is ashamed because I really did like the texture. Your presentation is just beautiful. Sorry it didn't taste as good as it looks! This is definitely one that's worth trying again. I finally made this ice cream last week - I used a fairly mild, slightly fruity olive oil and it turned out well. I'm sorry that it wasn't a hit, but your story is almost worth the whole experience! So Betsy actually brought me to the olive oil store in Grand Central Station and I bought fruity olive oil, but I have not yet made this ice cream again. Glad you enjoyed it.